Editor’s Note: Here is a fabulous example of the work of the KAIROS network. Members of the Salmon Arm Ecumenical KAIROS Committee had seen the documentary ‘Flin Flon Flim Flam,’ produced by award-winning investigative journalist John Dougherty, and wanted other communities to have an opportunity to see it also. John graciously agreed to come and speak if they could arrange a series of screenings. They knew that this would be a great educational opportunity, so with a little communication assistance from KAIROS national, screenings took place in 6 communities. Read about what the audiences learned and what you can do to promote mining justice. In late September, the documentary, ‘Flin Flon Flim Flam’ was screened in six cities in Southern BC. 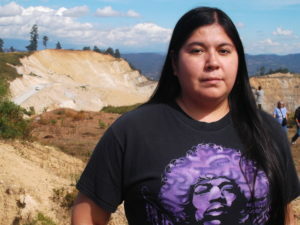 The documentary is an exposé of the human rights and environmental abuses of Hudbay Minerals Inc, a Canadian mining company that operated in Flin Flon, Manitoba, then moved to Guatemala and Peru, and is now seeking to establish an open pit mining operation in an environmentally sensitive area in Arizona. The documentary opens with Hudbay’s CEO expressing pride in the company’s track record and strong sense of responsibility. In sharp contrast with his words are scenes of environmental devastation in Flin Flon, and brutal repression of protests by Indigenous communities in Guatemala and Peru. For 85 years, Hudbay ran a copper extraction and smelting operation in Flin Flon, which polluted the air and left a legacy of heavy metal poisoning in the soil and water. A human health risk assessment by Manitoba Health showed elevated levels of metals in the blood of children in the area, but Hudbay claimed the health risks were minor. Protests by the local First Nation were either ignored or countered by legal action. It’s important to note that Hudbay did nothing that was not legal in this country at the time. Later, Canada introduced more stringent environmental protection regulations, and Hudbay found it cheaper to run its mining and smelting operations in countries such as Guatemala and Peru where workers’ pay is low, environmental protection laws are weak and unenforced, and international human rights law is ignored. The United Nations Declaration on the Rights of Indigenous Peoples stipulates that Indigenous people must be consulted about any project affecting their land, and that they have the right to free, prior, and informed consent prior to any work on a project being undertaken. Yet the documentary clearly indicates there was no consultation by Hudbay, and peaceful protests by Indigenous communities in Guatemala and Peru, whose claims to their land date back 1,000 years, are being met with extreme brutality designed to evict these people from their homes. The documentary notes that Hudbay refused repeated requests to be interviewed. However, a tape of the Hudbay CEO referring to the company’s strong corporate responsibility is juxtaposed against the heartbreaking words of Indigenous people whose homes and lives have been devastated. Hudbay is by no means alone in its human rights abuses. Two thirds of the world’s mining companies are registered in Canada and listed on the Canadian stock exchange, but they are not required to meet Canadian human rights and environmental protection laws in their overseas operations. For years, Canadian human rights organizations — such as KAIROS — have been pressing the federal government to establish the office of an Ombudsperson, who would have power to investigate complaints by persons who have been harmed by Canadian mining companies, and to make recommendations for redress. In January 2018, the Canadian government established the office of Ombudsperson for Responsible Business Enterprise. Canadians are watching to see whether the Ombudsperson is given power to compel companies to produce documents that would help determine guilt. These organizations have also been reinforcing the calls of people harmed by Canadian mining companies to be able to access Canadian courts to seek justice. Currently there are four cases against Hudbay ongoing in Toronto courts. 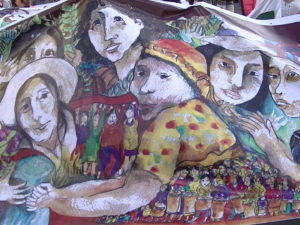 The documentary shows Guatemalan women plaintiffs in several of these cases outside Hudbay’s head office in Toronto speaking about the harm Hudbay has caused. 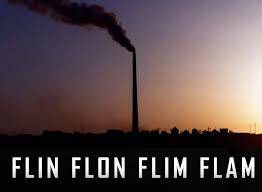 ‘Flin Flon Flim Flam’ is a stark portrayal of what it means to be under assault from a corporation that cares nothing for the people or the environment, where the primary concern is profit and keeping shareholders happy. 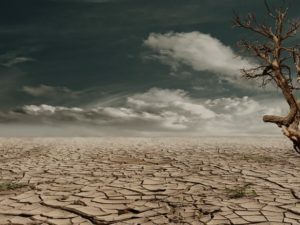 It is also a reminder that under our international system of national accounts, a clean, healthy environment, and the well-being of people living there have no value in themselves. Only when there is economic activity do they acquire ‘value’. John Dougherty, the award-winning investigative journalist from Arizona who produced ‘Flin Flon Flim Flam,’ spoke at the September screenings. Responding to a question about what we can do to make a difference, his suggestions included watching the documentary and encouraging others to do so; organizing and speaking out against human rights abuses by Hudbay and other mining companies; investing responsibly ourselves and becoming aware of how our pension funds are invested. ‘Flin Flon Flim Flam’ can be viewed on YouTube at: https://www.youtube.com/watch?v=j7aacPtEI8s> Or, search for ‘Flin Flon Flim Flam’, otherwise known as ‘Hudbay’s Hoax’.